Photo sphere actually has a relevant use now that Google announced at the IO conference that its Maps service will use the 360 degree images app for tours. The new Google Maps enables impressive user-generated tours of landmarks via photo sphere, with pictures showing up at the bottom of the redesigned Maps. An outside 3D model of St. Peter's Basilica in Rome was demoed off using "Google Earth in the browser" capabilities with no plug-ins and no downloads necessary. The beauty of St. Peter's Basilica is on the inside, noted Jonah Jones, lead designer of Google Maps. Jones transitioned to an indoor panoramic of the Vatican City church, giving the Google IO conference audience an interactive look at an almost-360-degree tour interior. 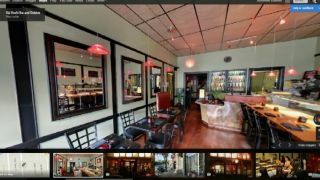 "This is a 3D photo tour that is automatically generated from user photos," said Jones, who added that over time "it will only get better and better." A little closer to home, Jones brought the Google Maps photo sphere demo back to the Google IO conference in the Moscone Center. First, he gave everyone the outside perspective from the perspective of skydivers, a nod to last year's more exciting Google Glass keynote opening. Jones then revealed that he had taken a photo sphere image of this year's audience while giving his stage demo and had already uploaded it to the new Google Map. "This is what you guys look like from up here," he said while showing off the recently captured photo sphere. "It's like a user-generated Street View," Jones said to applause. Google said that users won't want to wait for this, so it's rolling the photo sphere-filled Google Maps feature to users via invites starting tomorrow at maps.google.com/preview.